This month in the shopping bag: Girls, Girls, Girls. That’s my Mötley Crüe reference for the year. “Soldiers fell like lumps of meat, blown and shot out beyond belief” isn’t regular fare for a lead single’s opening verse, but that’s how “The Words That Maketh Murder” typifies Let England Shake’s treatise on combat’s grisly horrors and the dull aftershock that clings to a nation’s psyche. PJ’s time-travelled back to The Great War’s disastrous Gallipolli Campaign, with unsettling, unflinching imagery informing each of England’s songs. From the army bugler almost trampled underfoot in “The Glorious Land” to the villagers diving into the sewage-infested rivers to escape the carnage in “Written On The Forehead,” Harvey’s characters are drawn right at the life-altering moment of realization. England isn’t a full play; it’s almost like a collection of final acts. Harvey’s method masterstroke is in pitching her voice so close to trilling, sing-songy blitheness, and matching it to melodically catchy – even breezy – music. The foot soldier’s jingoist mentality is a mass delusion – just ask the poor Vietnam sap in Stevie Wonder’s similarly scathing “Front Line” – and by delivering England’s vignettes without a hint of harangue, Harvey leaves you to retch as you will. Vividly dramatic accompaniment for the RKO studios B-movie playing in your head. A motel crime scene, a cop on the take, a shifty femme with a gold-plated cigarette lighter, sweltering air you could cut with a letter opener. I was surprised to learn Calvi’s English, as so many of the sensory cues seem drawn from American potboiler fiction, with a twist of David Lynch’s noirish phantasms. 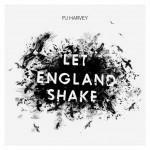 But I hear a little “Down By The Water”-period PJ Harvey too (Peej associate Rob Ellis co-produced). It’s a stone gas, honey. Anna Calvi starts with a motionless, lick-heavy instrumental, a pretty bold call for a debut album from a young singer, but then, assertiveness is an element of style throughout. Although the music doesn’t recall The Banshees in the slightest, Siouxsie’s theatrical grandeur looms large in Calvi’s strong, flexible vocals. Consider the roiling “Suzanne And I” and the cinematic “First We Kiss” end credits-calibre songs. “Love Won’t Be Leaving” is the triumphant, epic closer, with Calvi’s coiled, expressive guitar playing to the fore. Can’t wait for the movie. Time’ll tell whether the #184 Billboard chart placing means the world’s not ready for a “supermodel pop” sub-genre, but Oh Land steals marginally ahead of standard-issue Kylie in the “thrush pop” category (I’m just making these up as I go) by virtue of alluringly active vocal melodies, and thematic concerns that forego simple love-me-dos for dreams, hopes and categorical dismissals of bad friends. So forgive this ex-Royal Swedish Ballet student for having the best cheekbones in pop since a-Ha, and feed off the solid electro of “Human,” “Voodoo” and the Goldfrapp-like “Sun Of A Gun.” The undercard slot on OMD’s recent North American tour placed Oh Land before a hypothetically simpatico audience, but in such company her songs tended to float like butterflies while the headliner’s stung like bees. Curiously, YouTube’s full of clips showing the unusual arrangements in a different light: less reliant on beds of synth, there’s a twitchy Bjork influence Oh Land could push if she wanted to confound everybody. Supermodel Bjorkpop?